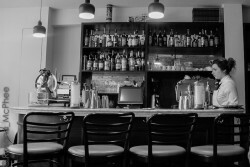 Think a slice of 1950s style Little Italy in Soho dreamed up by coffee whiz Marco Arrigo and cocktail maestro Tony Conigliario and that’s what Bar Termini is all about. Everything is simple in the traditional Italian way so the best coffee and the best cocktails. We particularly like that there are three different kinds of Negroni, Gintime’s favourite cocktail. So you choose between the Rosato (rose-petal infused), the Superiore (pink peppercorn-infused) and the Classico all made with Beefeater Gin. Each one is pre batched, aged and served in special small glasses. No ice so the flavours remain true and, indeed, perfect. Bottles of ready made Negroni are also available to buy direct on line. Bar Termini is not a restaurant but small plates of cheese and charcuterie are available to mop up the hunger pangs. If you’re in Soho for the evening it’s the perfect place to meet either early or late but if you want to go with a large group it’s best to book ahead. We’re fans!